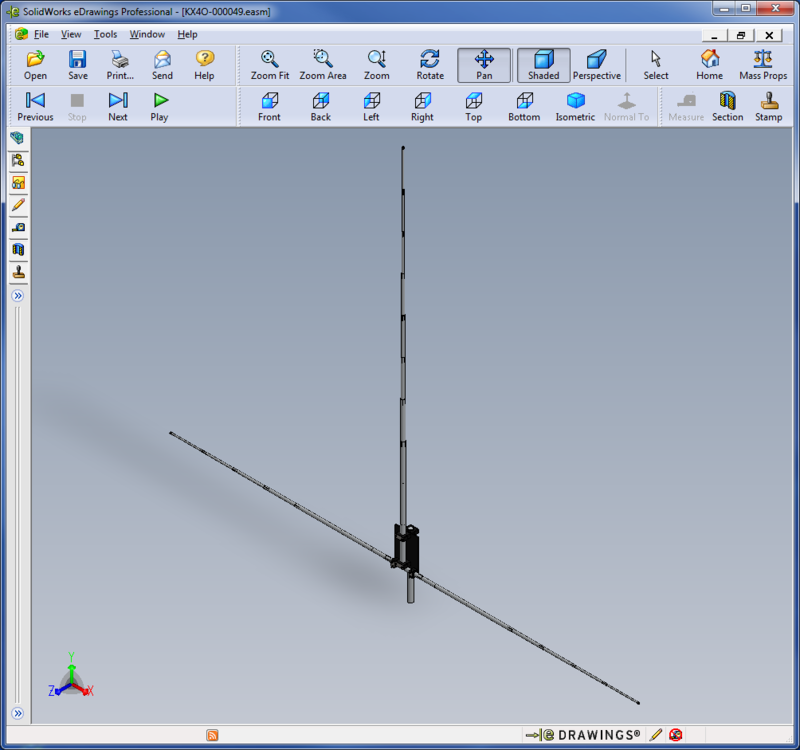 The master build drawing for the Asymmetrical Hatted Vertical Dipole antenna assembly, KX4O-000049, is a boring 2D affair that does at least give you a good BOM and a decent idea of how to put it together. …but this is the 21st century right? 2D is so last millennium. I finally got around to learning Solidworks and used this particular design as my test case after working through some tutorials. One of the best aspects of Solidworks is the ability to export something called an E-Drawing. With a free viewer from Solidworks, you can pan, zoom, spin and do all sorts of things. It’s too bad I cannot get the E-Drawing to animate the concentric poles the way I can in the actual CAD program. It’s pretty cool – I move one vertical pipe and the rest adjust by appropriate amounts to ensure each pipe overlaps the same amount. Note, I’m not yet cool enough to draw convincing pipe clamps that pass my internal quality goals so those are missing from the E-Drawing. However, all the aluminum pipes and some example hardware from McMaster-Carr are shown along with the DX Engineering components that hold it all together in the hub section. Note also I only show the top most mast portion of the On-Stage speaker stand. What you see is enough to understand how to mate the AHVD to the stand. Plus who’s to say the AHVD will always mount to a field ready tripod. My AHVD Yagi-Uda plans might position three 1-1/2 inch diameter posts on some sort of boom for a Field Day directional vertical beam. Yes… I am a Field Day junky. Designing in the 3D realm is an obvious no brainer so I’m glad I finally got past the 8-track phase.